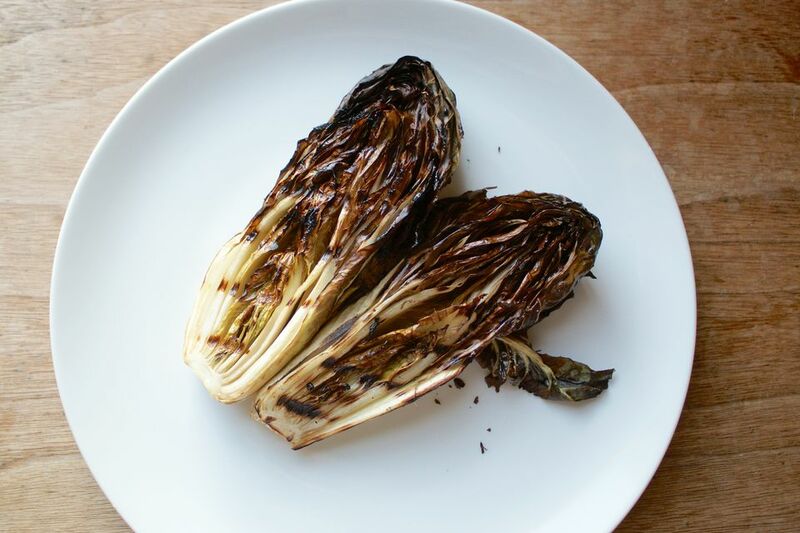 Treviso—a longer, thinner, looser version of tight-headed radicchio—gets its bitter edge tamed by the flame and a drizzle of balsamic vinegar in this beyond easy recipe. Since grilled treviso keeps a bit of the vegetable's pretty red color even as it cooks, it's a delicious—and striking—addition to any grilled vegetable platter. Note that while the leaves will be tender enough to eat, they can be a bit tricky to cut, even once they're tender; you'll want to provide diners with a fork and knife to tackle these if you serve the halves whole. The alternative is to grill the heads and then chop them up before serving. Heat a gas or charcoal grill to medium-high heat. While the grill heats, trim any browned edges from the stem of the ​treviso. Cut the treviso in half lengthwise. Rub or brush the entire treviso halves with oil. Set the treviso cut-side down on the grill. Cook until the edges are well browned, about 4 minutes. Turn, sprinkle the cooked cut-side with salt and cook until the entire treviso is nicely browned and wilted -- about 4 more minutes. Remove the treviso from the grill. Transfer to a serving platter and drizzle with balsamic vinegar. Serve hot, warm, or at room temperature.